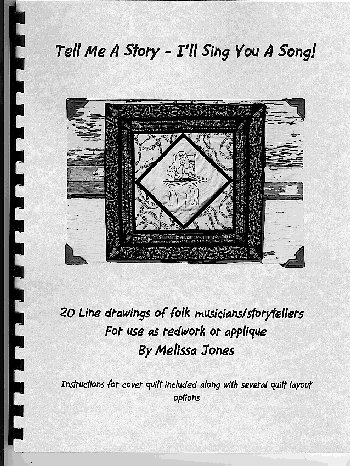 "Tell Me a Story - I'll Sing You a Song"
This pattern book contains 22 line drawings of folk musicians that can be used for needlework, including redwork, applique, 'thread painting' machine embroidery, or hand embroidery. Books sell for $6 US + $3 S&H Checks and Money Orders accepted.Email for mailing information. Here are some examples of ways to use the patterns. Click on the thumbnail to see a larger picture. 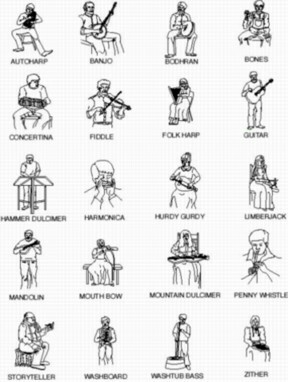 Coming soon folk instrument embroidery designs CD. View My Guestbook Send this site to a friend.